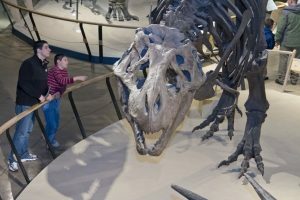 The Division of Research and Collections of the Cleveland Museum of Natural History is seeking a highly-motivated researcher in the area of vertebrate paleontology. The vertebrate paleontology collection at the CMNH houses approximately 15,000 specimens, with representatives from each of the major vertebrate groups. The collection is highly specialized and emphasizes the Paleozoic, particularly locally collected Late Devonian fish (mainly chondrichthyans and arthrodires) from the Cleveland Shale Member of the Ohio Shale. The extensive and diverse collection of arthrodires provide a unique picture of the group at the height of their evolutionary radiation, and the mode of preservation of the shark fossils is exceptional, often preserving body outlines and identifiable stomach contents. While the primary strength of the collection is the Devonian fish, the department also houses an important collection of Mississippian amphibians and early reptiles from West Virginia. The department houses a small, but unique collection of dinosaur remains, including the holotype of the rare Morrison Formation sauropod, Haplocanthosaurus delfsi, and the holotype of the tyrannosaur, Nanotyrannus lancensis. Additionally, the department houses a representative collection of Oligocene mammals from South Dakota, and Pleistocene mammals from the Northeast Ohio region. Areas of research discipline could include, but not be limited to, systematics, functional or evolutionary morphology, paleoecology, and biomechanics. The Museum is particularly interested in connecting paleontological research with our visitors and the community. The curatorial staff at the CMNH are expected to develop research programs, in their appointed area, that integrate with Museum strategy and vision, collaborate across the Museum and the region, incorporate student training, incorporate public outreach, support public programs, enhance institutional collections, and attract external funding. The CMNH maintains an affiliation agreement with Case Western Reserve University for curator adjunct appointments, within the Department of Biology, that enables both teaching and graduate student advisement. Curators at the CMNH also provide oversight and direction of the collections through collaboration and interaction with the collections management staff. Applicants must hold a Ph.D. by the time of appointment in vertebrate paleontology or related field. Applicants should submit cover letter, a curriculum vitae, a statement of research intent (no more than four pages), a statement of Museum integration that addresses interest and experience with student training, public outreach, and Museum programming (no more than four pages), three letters of reference, and copies of three significant publications. Review of applications will begin on April 1, 2019 and continue until the position is filled.